Before you read this post further, I suggest you watch this 3 minute streaming video clip above. 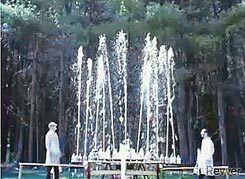 It shows an experiment of Mentos mixed with Diet Coke to create bubble fountains of Mint that reach upto 20 feet high. Some 101 bottles of soda and 500 Mentos candies were used for this video. As kids, we used to sprinkle black rock salt inside chilled Pepsi glass bottles and loved the carbonated effervescence. So what's so unique about this soda blast video ? It's more to do with the way these guys decided to market their video than actually producing it. Fritz Grobe and Stephen Voltz who work with a local theater company copied the idea from an amateur version hosted on Google Video. They added some background music and made a more professional looking version. The duo uploaded their creation on Revver which shares advertising revenue with the content creator. The video was a viral hit and viewed about 2.5 million times on Revver.com and generated $30,000 in advertising - $15,000 for Revver and $15,000 for its creators. The success of the Diet-Coke-Mentos video will boost the bottom lines of Coke, Mentos and Revver but it may not be a good news for YouTube or Google Videos who keep all the revenue in their pockets. If a person creates a video that has the potential to become a hit, why would he want to upload it on YouTube instead of Revver ? YouTube or GoogleTube may bring in more viewers but Revver would bring in more dollars. Viewers would come anyway via Digg, del.icio.us and Reditt if your content gets popular. If we see more videos on Revver that attain the success levels Coke-Mentos, YouTube and Google may have to revisit their business model. Otherwise good content providers would switch to video uploading sites that share revenue with them and YouTube/GoogleVideo would just become another place to see amateur content which nobody enjoys except the person who produced the video. EepyBird team explains the science behind the experiment and if it works with other things like Mountain Dew, M & M, Sprite or Alka Seltzer. WikiHow has a detailed tutorial with illustrations on how to produce a soda volcano at home. Update: GoogleVideos has some 600 videos on coke-mentos while YouTube has 1600 videos. Even the EepyBird video has made to YouTube much to the dislike of their producers. Update: Om Malik notes that the number of YouTube-like services now stands at a staggering 173. Analyst predict that there'll be a lot of casualties in the next year. "It's not possible that this many video-sharing sites can exist and make money," says David Hornik of August Capital, a backer of video services company VideoEgg.